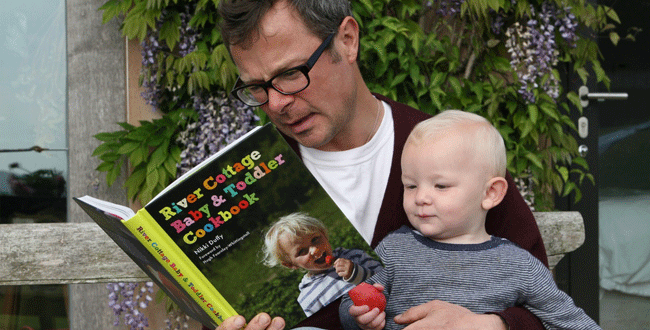 I was very excited when I saw that River Cottage had brought out a baby and toddler cookbook. In fact, I was so excited I got in touch with them and asked if I could please, please have a copy. They are a kindly lot over at the Cottage, so it wasn't long before a copy had arrived on my doorstep. It was as I anticipated, as good as it looked. I do love watching River Cottage when it is on tv. I missed out on it for years because I thought Hugh Fearnley-Whittingstall was all about meat. I curse myself now, because I realise he is a great cook, who loves to cook seasonally and does wonderful things with fruit and vegetables too. Hugh has a great team around him at the River Cottage Farm or HQ as they like to call it, down near the Dorset/Devon border and it is one of his team Nikki Duffy, who has penned this rather wonderful cookbook. As the mother of three herself, Nikki was able to take the River Cottage ethos and combine it with her own common sense methods to come up with some great recipes and some very sound advice. She did also work with a paediatric dietitian when researching for this book, to make sure she got it right. There are some great recipes in this book that I cannot wait to try, such as: White Bean Hummous, Spinach & Onion Puff Tart , Veggie Bean Curry, Polenta Chips, Spelt & Apple Stars and Plum Cobbler. I could go on, but that gives you an idea. There are of course recipes for meat eaters, but I am pleased to say there is a rather large selection of dishes suitable for Cooper. 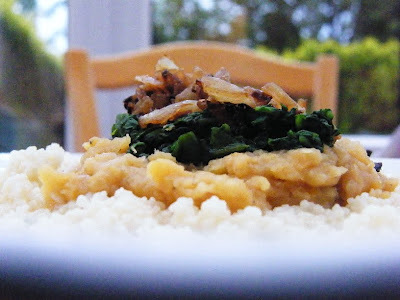 I decided to begin by trying Lentils with Onion & Watercress. I am sorry to say I couldn't lay my hands on watercress anywhere, so I substituted it with baby spinach. 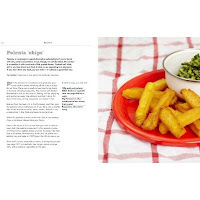 So, if you are looking at the photo and thinking that doesn't look like watercress, then you are quite right. I was really impressed with this dish. It was really delicious and a great combination of flavours. I would definitely eat this myself as a side dish or with some rice and chapatis. I may add a few spices for us, although it did still taste good plain and I did add some freshly grated nutmeg. Cooper however was not as impressed with this dish. I have heard that children, when they reach two can start to become fussy about food. Well, it seems Cooper is starting early. He is fine with dishes he already knows, but give him something he doesn't recognise and it is likely he will hold up the back of his hand to you, turn his face away and completely refuse to even look. It is very frustrating, but I try not to get too stressed about it. I don't want mealtimes to become stressful, I know that could lead to a very bad place. I was interested to read in the River Cottage Baby & Toddler Cookbook that there is actually a name for this - Neophobia (fear of the new) and that is a actually perfectly natural developmental stage. Here is a quote from the book: "The theory is that this phase evolved to help and protect a curious and newly mobile child from eating harmful or poisonous things. So if it seems that your toddler is treating unfamiliar food with outright suspicion, as if they think you might be trying to poison them, it's probably because that is exactly what they are thinking.... at roughly 18 months, children begin to adhere to rigid visual stereotypes - which means they don't eat anything that doesn't look right. So tomatoes may be fine, but tomato sauce isn't." This is so true, Cooper used to love fruit and is now suspicious of it most of the time and yet if I whizz it up in a smoothie he gulps it down as if he hasn't had anything to drink in a week. So I will persevere with fruit and also try this dish again and again as well as many others and hopefully he will become more confident and they will become favourites. Put the lentils and chopped garlic in a saucepan with 400ml/2 cups water. Bring to the boil, turn down to a gentle simmer and cook, stirring often, for about 20 minutes, until the mixture is thick and the lentils are starting to break down, adding a little more water if necessary. Heat the oil in a frying pan over a medium heat. Add the onion fry for about 10 minutes, stirring often and keeping the heat at medium. The idea is to get the onion to start to caramelise and brown just a little. 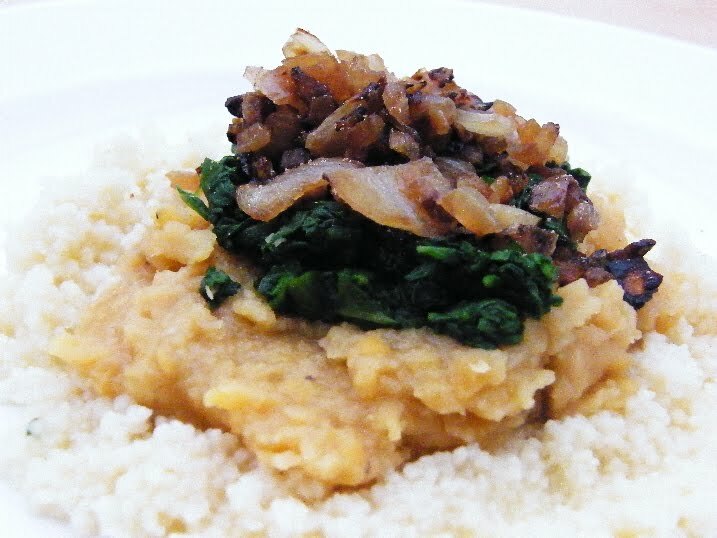 Combine the cooked lentils with the chopped watercress and cooked onion. Season if you like, (I grated some nutmeg over the dish) and serve hot with rice or bread. I served it with some giant couscous, which was kindly sent to me by Mangocheeks. This dish can be pureed for your baby. 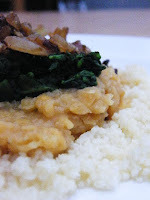 When pureed it is also a good dip for rice cakes or vegetable batons and freezes well. I am hoping he will Tanita, well actually I am counting on it. He does eat really well normally and quite a lot of different things, so I will not panic too much. It was lovely seeing you and David on Monday. I feel quite upset that you are planning to leave Scotland :( I know we don't see each other very often, but I know you are there and that we can visit occasionally. *sigh* Oh well, it will be exciting for you. yes yes yes. this is just my kind of meal. i don't have kids, though, can i still make it? ;-) glad to hear you came around to Hugh in the end. I do love River Cottage, and his ethos. He's all about the FOOD - meat and veg. And I love that he's raised the profile of sustainable, humane animal farming. I might not eat his meat, but I do fully support what he does. Except for his hair - not liking the new hipster haircut he's sporting in that photo! Bring back the curls! Hmmm..I know a lot of people who suffer from neophobia. The meal looks good to me though. Maybe I can have Cooper's portion. I have never heard of neophobia, but it certainly makes sense. My elder son had it from 18 months to 14 years old, he lived on potato waffles and spagetti hoops! My younger son just ate everything you put in front on him and still does. It's not an easy thing to manage, you just have to do your best. Oh no don't say that Janice, I am trying to be optimistic. Jac, Cooper only just started on you... if you're lucky, then the phase will only last a few months. I was quite stressed when Aditi started refusing food she'd loved... but like you said, I persevered, and we're back to trying stuff out again. I found that if you involve them in the cooking, it makes a huge difference to their willingness to try out the dish... Aditi refused to eat eggs for a long time, but once I started getting her whisking them, she started to try them out again. Thanks Michelle, I do lift him up to stir dishes on the cooker. I actually give him this one with cous cous, but he does eat rice. He is just generally suspicious of what I feed him at the moment. He used to open his mouth wide for everything. I think the cold he has just now is not helping though. I am not going to stress, well I will try not to. We are just going to have to accept them as they are Johanna and hope they broaden their likes as they grow. AT least Sylvia and Cooper are getting plenty of fruit and veg. Great review. 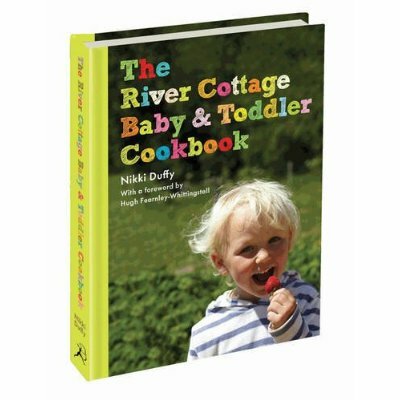 I'm a recent River Cottage convert too, as I also thought all Hugh's recipes revolved about home reared/home killed meat. His latest series has been great though. 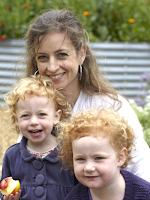 My kids have both been raised as veggies and have been though fussy phases. As chicken nuggets have never been an option, they have had to learn to love home-cooked veggie food! Cooper too. He enjoyed his mummy's homemade soup tonight, which is a great thing. At last i am able to comment Jacqueline. If only there was as much information out when L'il Burnt Toast was a toddler. Of course she has chosen her own path and eats more healthily than I.
Blogger has been a pain tonight Val. Very frustrating! I am gladyou took the time to come back over. I'm sure Cooper will come round to different foods again. It does make sense in an evoluntionary way though, to start refusing food. It must be very frustrating though, so good luck! It is a bit frustrating, well heck a lot frustrating actually, but I am not going to get stressed C, just have to accept it and try my best.